As co-founder and marketing director of mmMule (now PiggyBee.com), I was responsible for research, UX, product development, social media, marketing campaigns and public relations. 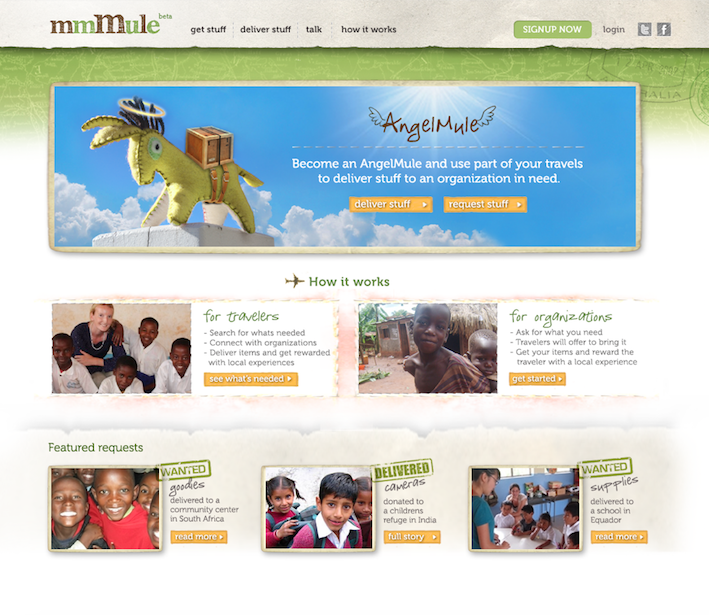 I managed our social impact arm AngelMule and it's related outreach and ambassador programs. mmMule was launched in the early days of the collaborative consumption movement & was a key player in the emergence of the Australian peer-to-peer startup space. mmMule was s a peer-to-peer social travel network connecting travellers with local experiences. mmMule let you get anything you wanted from anywhere in the world by rewarding a traveller for delivering it. Our social impact arm, AngelMule connected travellers with non-profits that were in need of supplies.